Having colorectal cancer affects you in many different ways. For example, life with cancer and the demands of treatment are often stressful – for both you and those who care for you. Treatment for this type of cancer may also cause lasting changes to your body’s appearance or function. These are challenges you do not have to face alone. 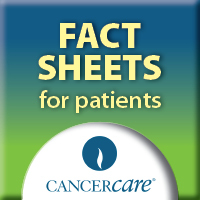 Here are some ways to cope with colorectal cancer and the effects of treatment. Find out what to expect. Talk with your doctor about your treatment options and what you can expect from each option. Ask if new predictive tests (such as KRAS testing for people with metastatic colorectal cancer and the Oncotype DX colon cancer assay for stage II patients) are right for you, and what the results might mean for your treatment. Be open about any concerns or fears you may have. Whatever is on your mind, feel free to mention it, even if it seems trivial. No question is too unimportant to ask. Stay well-nourished. You may find it hard to eat normally during your treatment for colorectal cancer, but it’s more important than ever to stay well-nourished. If you have trouble eating solid food, try fruit and protein drinks, like smoothies or liquid nutritional supplements. If diarrhea is a problem, a low-fiber diet may help. Talk with your doctor about your nutritional needs, and consider working with a nutritionist. He or she can come up with a meal plan to help you consume the calories you need to maintain your body weight. For example, some people find it helpful to eat several smaller meals throughout the day rather than three large meals. Get plenty of rest, but take time to be active, too. Cancer treatment is stressful and exhausting. Try to get as much rest as you need. Sometimes physical activity can also help you feel less tired and better able to cope. Talk with your health care team about how much and what kind of activity is right for you. Talk with your partner about physical intimacy. Both you and your partner may have concerns about physical intimacy during and after your colorectal cancer treatment. Discussing your needs and concerns can help both of you adjust to changes that may result from your treatment. Seek emotional support. As you adjust to the changes in your life after a diagnosis of colorectal cancer, you may feel sad, anxious or lonely. Many people with colorectal cancer have these feelings. Tell your doctor or another member of your health care team how you are feeling. They may be able to arrange for you to see a health care professional who specializes in helping people with cancer cope with the emotional issues that come up during and after treatment. For example, CancerCare has professional oncology social workers on staff who provide free individual counseling to people with cancer and their loved ones. Join a support group. A support group connects you to other people coping with colorectal cancer and treatment. You can share experiences and learn from others going through similar situations. CancerCare‘s support groups are led by professional oncology social workers. We offer face-to-face support groups, as well as telephone and online groups for those who are not able to travel to meetings.